Vishwa Jagriti Mission is a charitable and social welfare organization which was founded by His Holiness Sudhanshuji Maharaj with a Mission to nurture, guide and invoke the inner strength of all human beings equally and to feel the presence of God. The Mission strives to take the suffering humanity from sorrow to bliss, disharmony to harmony and self-service to serving the humanity irrespective of religion, caste and creed. Mission is trying to free the society and harassed humanity from antipathy, animosity, malice, hatred, violence and revenge. 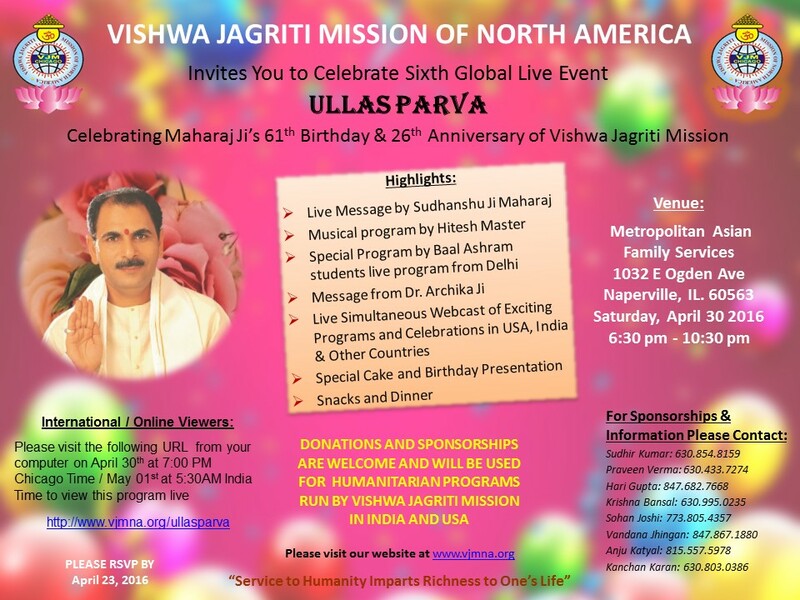 VJM - North America is a branch of this gigantic tree of Vishwa Jagriti Mission. The VJMNA has been moving forward spreading the love and light along with the golden principles of His Holiness Sudhanshuji Maharaj. It has become engaged in several missionary activities for the citizens of our community including Humanitarian Services, Child and Youth Education, Spiritual camps, etc. here in the North America. The aim of the mission is to kindle the bright flame of human welfare through various projects by inculcating high felling such as love, faith, affection and fellow-felling, co-operation and charity, self-study, simran, sadhana, and a deep sense of spirituality and god in the hearts of all. His Holiness felt that a heavenly environment should be created in the whole society so that the lotuses of joy blossom forth in every courtyard, and the senior and old persons, mentors (gurus) and teachers are always respected by all. Children should offer happiness, respect and honor to their parents, the youth should realize their duties and responsibilities, and utilize their energy in furthering the cause of religion, culture and human values and in building in their nation. Every sector of society should respect women and every child should discover the path of progress under the begin love of his mother and father. No one should be called an orphan on this earth of lord Jagannath. And mankind should scale the highest peaks of divinity through peace, brother hood, co-operative, non-violence and harmony spread all over the globe. Adopt or educate a child. Think about the difference you can make and smile you can bring on an innocent face by a very small pledge that may be less than your one time meal. Click here to learn more.